Ghostface Killah, Tech N9ne, Chief Keef, & many more! This summer will bring the first-ever KROQ Presents High & Mighty Festival. The brainchild of Sublime With Rome and Dirty Heads, the two-day event will make its debut on Saturday, August 5th and Sunday, August 6th at Orange County's beautiful Oak Canyon Park in Silverado, CA, adjacent to Irvine Lake. Produced by premier music festival production company Synergy Global Entertainment (SGE), Mike "Cheez" Brown, and Bill Hardie, High & Mighty Festival will feature two stages of music performances from top reggae, roots, hip-hop, and rock artists, plus lifestyle vendors, carnival rides and games, and onsite activities in a lush scenic setting, tucked into the mountains of Southern California. Venue capacity has been reduced to 8,000 to allow for easy traffic flow to and from Oak Canyon Park. The expansive oak trees, gorgeous grass, and picturesque lake set the perfect tone for a relaxing time in the shade. Sublime With Rome, SOJA, Stick Figure, Method Man & Redman, Magic!, Ghostface Killah, King Lil G, Custom, Landon McNamara, and Iya Terra, with more to be announced! Dirty Heads, Jurassic 5, Tribal Seeds, Tech N9ne, Chief Keef, Murs, Ballyhoo!, Katastro, Pacific Dub, and Know-Madik, with more to be announced! Rome Ramirez from Sublime With Rome exclaims, "The secret is out!! 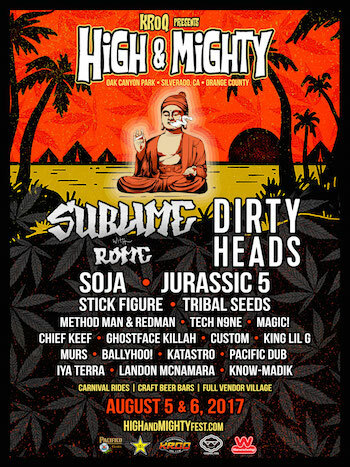 Southern California, get ready for High & Mighty!! This festival is extra special to us not only because it's in our hometown, but because we're partners in the event! We wanted to create something special for the fans that help make this music become as big as it has, and what better way to do that than to team up with KROQ and throw a massive festival in Orange County? So grab tickets and come celebrate with us!" Jared Watson from Dirty Heads adds, "We are excited to be putting on our own festival with artists that have influenced us in the past, artists that are influencing us now, and artists that we have come up with. Not only is the lineup insane, but we get to put on a show in our backyard. We get to show people the community that we've had the pleasure of being a part of and helping to build." Mike "Cheez" Brown, High & Mighty co-producer and manager of both Sublime With Rome and Dirty Heads, says, "I've been kicking around this idea for a while with Sublime With Rome and Dirty Heads to do our own thing. With Irvine Meadows closing, we knew Oak Canyon would be the perfect setting for something special for our fans here in Orange County. Come check it out, it's going to be memorable." High & Mighty co-producer John Reese of SGE says, "I'm stoked to be partnering with Sublime With Rome and Dirty Heads to bring High & Mighty to life. We're curating a killer summer experience in the solitude of Oak Canyon Park, with plenty of surprises in store for everyone." High & Mighty co-producer Bill Hardie adds, "The team we put together for this event is not just flying a flag of convenience. We live this. This is our life in black and white." A KROQ-FM pre-sale will run on Thursday, April 20 from 10:00 a.m. to 10:00 p.m. PT at www.kroq.com. Tickets for the general public go on sale Friday, April 21 at 10:00 a.m. PT at www.HighandMightyFest.com. Single-day tickets start at $65.00, plus parking and fees. VIP Lounge packages are $149 per day. This includes 1 VIP admission ticket to the selected day of the festival; a designated VIP entry lane into the venue; a commemorative laminate; and access to the VIP Lounge, which will feature a VIP cash bar, access to a VIP viewing area of the main stage, VIP restrooms, comfortable areas to sit and relax, and purchase options. Meet & Greet — Sublime With Rome packages are $299. This includes 1 VIP admission to the Saturday date of the festival; a designated VIP entry lane into the venue; a commemorative laminate; access to an intimate Meet & Greet with Sublime With Rome (at a designated time) and photo op; a limited edition High & Mighty poster; and access to the VIP Lounge, which will feature a VIP cash bar, access to a VIP viewing area of the main stage, VIP restrooms, comfortable areas to sit and relax, and purchase options. Meet & Greet — Dirty Heads packages are $299. This includes 1 VIP admission ticket to the Sunday date of the festival; a designated VIP entry lane into the venue; a commemorative laminate; access to an intimate Meet & Greet with Dirty Heads (at a designated time) and photo op; a limited edition High & Mighty poster; and access to the VIP Lounge, which will feature a VIP cash bar, access to a VIP viewing area of the main stage, VIP restrooms, comfortable areas to sit and relax, and purchase options. Sponsors for High & Mighty Festival include Modelo / Pacifico, Rockstar Energy Drink, Cosmic Fog, Wienerschnitzel, and more.